Oscar Schindler went about his life without Jesus Christ on his radar. The hard-living, womanising, war-profiteering Austrian amassed huge wealth off the back of deprived and dispossessed Jews in Hitler’s realm. He lived large and spent big, as he bought his way into the privileged echelons of the Nazi Party. He took advantage of Nazi policies that forced Jews to give up their possessions and work for nothing. The government furnished him with a steady stream of free Jewish labour to build up his business. He applied their brains and brawn while he busied himself satisfying whatsoever needs his appetite demanded – mainly women. After the war and without Jewish labour and ‘investment’, Schindler failed at every endeavour. But how he faired after the war did not matter as much as what he did with the gains of sin. For unbeknownst to him and to most who have told and re-told his story, Schindler had a divine calling upon his life. 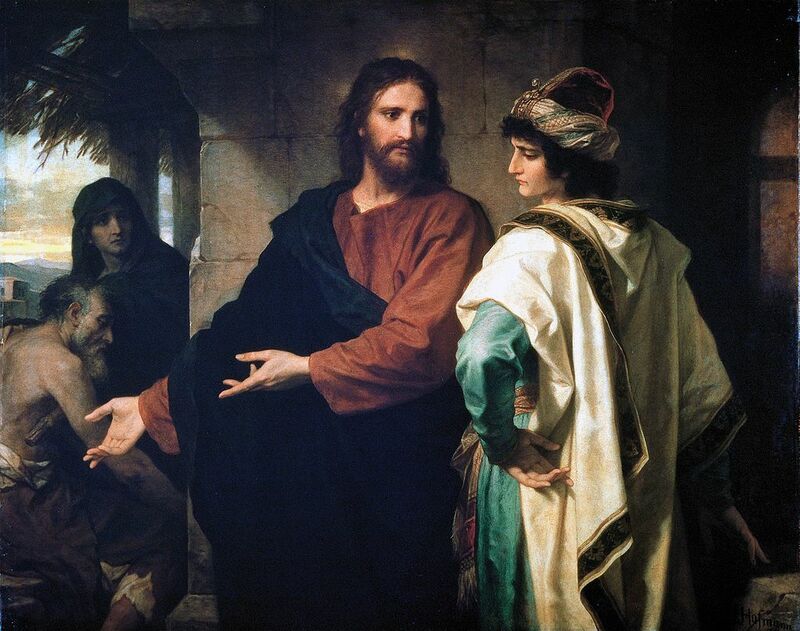 Much to the manner of the widow of Zarephath who did not know that she fed the man of God at the behest of God, Oscar spent all he had saving the Jews that worked for him and bankrupted himself in the process. In so doing he gave a lie to those who say Jesus’ request to the rich young ruler was over the top. Oscar Schindler spent all he had saving the Jews that worked for him and bankrupted himself in the process. The general consensus is that the rich young ruler and most with great possessions tend to put their trust in their wealth instead of God. As true as that may be, there might also have been more to Jesus’ request and retort. As Honore de Balzac said: “Behind every great fortune lies a great crime”. It’s not the first time scripture inveighed against the rich. In fact God birthed the whole Abrahamic project as a protest against all manners of injustices.3Genesis 18:18-19 Elijah,41 Kings 21:17-21 Jeremiah5Jeremiah 22:15-19 and Amos,6Amos 5:11-24 were three of the prophets who cried against oppression, injustice and the exploitation of the poor. The rich young ruler and most with great possessions tend to put their trust in their wealth instead of God. Therefore at one level it’s possible that what the Lord requested of the rich young ruler was to rid himself of the gains of sin; to make restitution to those off whose back he probably amassed his wealth. Zacchaeus the publican knew enough to commit to doing something similar because he did not need to be told that there could be no heaven without repentance.7Luke 19:2-9 Unlike Zacchaeus, the rich young ruler chose to keep his wealth. Before the gentile converts to Christianity wrote them out of the Bible, care for them and their welfare was central to church policy. Redistribution of wealth within the fledgling Jesus community was a pillar of faith. It wasn’t a question of ‘works’ versus ‘faith’ polemics or any of the other dogmas that have upended that which Jesus committed to his disciples. Rather, it is more a question of where and how to commune with Jesus. In Matthew 25:31-46 Jesus gave a revelation to all who seek a communion with him. Jesus would not be hanging about in cathedrals. He would not be spending time soaking up adulation in great assemblies. He would not be jetting about with signs-and-wonder-working ‘anointed’ men and women of God. He said he would be found in the ailing, the homeless, the imprisoned, the destitute, the deprived, the dispossessed, the castaway, the hungry, the naked, and in any and all that are side-lined to the fringes of societies. Christ’s vision is about partnering with God in a faith project towards the eradication of poverty and all manners of social ills. The early church set about establishing a community that reflected Jesus’s vision. That was Christ’s vision for his church. That was the path he called the rich young ruler to walk. It’s about partnering with God in a faith project towards the eradication of poverty and all manners of social ills. It’s a vision that was always dear to God.10Isaiah 58 Christ’s was a call for a robust social action for redressing socio-economic disequilibrium. It’s not the name-and-claim, seed-sowing, tithe-paying, first-fruit-giving farce that is the fad in the church nowadays. When the faith became the creed of an empire built on and sustained by policies that were the very antithesis of Christ’s stated vision, something had to give. First to go were Christ’s beloved Ebionites and his social vision of a welfare community. Church fathers became oligarchs who hobnobbed with imperial power. Theology replaced humanism and a will to power replaced the will of Jesus. Christ’s was a call for a robust social action for redressing socio-economic disequilibrium. It’s not the name-and-claim, seed-sowing, tithe-paying, first-fruit-giving farce that is the fad in the church nowadays. Over the millennia, thanks to the likes of Luther and Calvin, understanding ‘Grace’, ‘Justification’ and ‘Salvation’, became big theological preoccupations. The stuff Jesus had done for us overshadowed what we are called to do for Jesus. A faith that was committed to illiterates and dregs of the Judean world for the care and edification of illiterates and dregs of the whole world was hijacked by the lettered and privileged of the Roman world.